Bringing Paper to Life Blog Hop – Welcome! Hi Angels! Welcome back to my blog & the 1st Blog Hop of the new catalog year. This month’s theme is Bringing Paper to Life. If you arrived here from Kim’s blog then you are right on track, if not, no worries, just keep hopping until you come full circle. I just love the new Mystic Romance collection. Almost all of the stamps in this collection look like they have been stitched or embroidered. I selected the Dreams Follow stamp & die combo to make today’s card. The card base is Pool Play with a layer of Pretty Amethyst embossed with the Mystic Impressions Embossing Folder. The background & butterfly were splashed with Sparkle Silk. 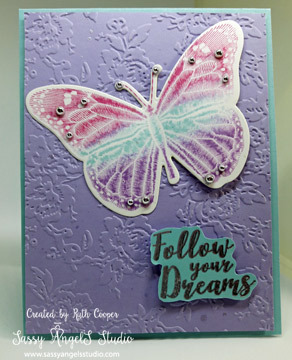 I used Watermelon Fusion, Pool Play & Lavender Fusion inks to ink the butterfly, then die cut & embellished with the new Fashion Silver Metallic Dots. One wing on the butterfly is popped with Journey Foam Squares as well as the sentiment. The sentiment is embossed with Silver Embossing powder. I hope you enjoyed today’s project. Hop back by tomorrow for another blog hop featuring the July Bloom Box Mermaid Kisses. Hop on over to Heather’s Blog to see her great project.